Inspur International (00596) had issued a profit alert as early as mid-July. At that time, it was expected that the interim results would record a net profit of about 80 million. As a result, the interim results announced on Friday, the net profit was 120 million, which is more than the expected earnings. The net profit of 80 million is 40 million higher. Revenue rise, gross margin rose, net profit rose, and look at the company’s performance in the past few years, seems to have a seasonal effect, the performance in the second half is far better than the first half, that is, the annual net profit should be more than 240 million. Inspur Tianyuan Communication will be in line with Inspur International in August. It has a great opportunity to provide an additional 26 million for Inspur International and a profit contribution of 75 million for next year. Based on this calculation, Inspur International’s net profit this year is close to 300 million. Based on the current market value of 3.36 billion, the expected price-earnings ratio is about 11 times. The valuation is much cheaper than its peers KINGDEE (00268) and CHINASOFT (00354). 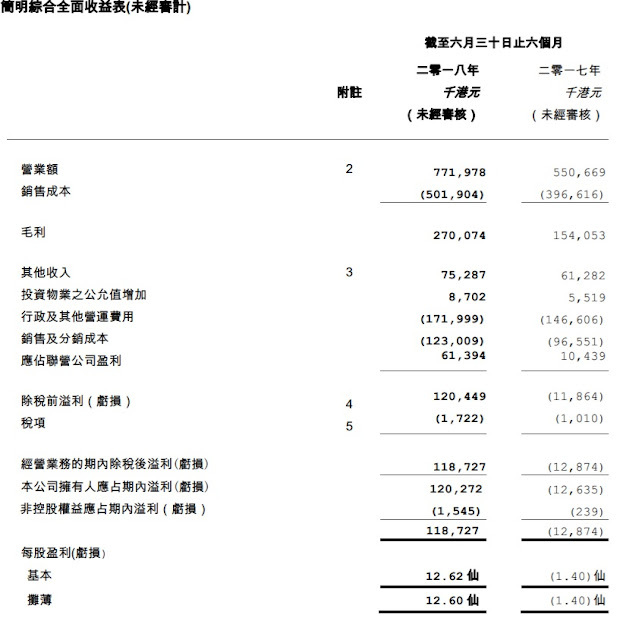 Finally, it is worth mentioning that the shareholding of major shareholders has increased significantly from about 34% last year to 54% this year, including a conditional offer of $2.1 per share to 50% equity, and then in the acquisition of Inspur Tianyuan Communication, per The stock was issued at a price of 2.65 to pay the purchase price, which caused the parent company to increase its shareholding to approximately 54%, reflecting the parent company’s confidence in the prospects of Inspur International. This entry was posted in Investment on 21 August, 2018 by Wai Gor.